Successfully Added Finger Print + Access Code Dead Bolt Door Lock (Left) to your Shopping Cart. Presidential edition double action fingerprint and access code security door lock for your office, business or home. Get 100% safety at your entry point with this maximum security style deadbolt double action lock. 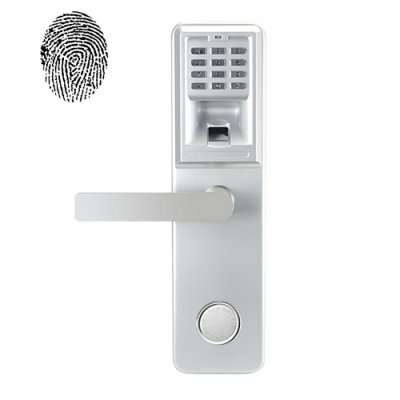 What you get with this fingerprint door lock is complete peace of mind with a guarantee of 21st century security, meaning this lock cannot be picked or hacked. If no one is authorized to have access, then they will never be able to gain access. Since the CVJJ-G97 can be installed on all wood or metal doors that are industry standard 40-50mm thick, it is perfect for almost every office and home entry. Photos & Graphics By: R.W.